Electricity Grid Schematic by MBizon. Downloaded from wikipedia.org. There is something that we use all day every day. We couldn’t live as we do without it, yet, for the most part, we never look at it. We just assume it will always be there, until it isn’t, and then we are most unhappy! What is it? The electrical grid, of course. In 2014 I did a series of posts describing The Grid, how it worked, and the reliability issues it was facing. This post begins a series updating that work. The most recent NERC Long-Term Reliability Assessment was published in 2017. By the time this series of posts is finished, readers will understand what it means. The Grid is the interconnected network that delivers electricity from suppliers to consumers in the Continental United States, most of Canada, and a small portion of Baja California. Figure 1 shows a schematic drawing of The Grid. Electricity is generated in thousands of generating stations across the country. It is gathered together over high voltage lines and stepped-up to ultra-high voltage, which is more efficient to transmit over long distances. It is then transmitted over ultra-high voltage transmission lines until it nears its destination. Then, through a series of steps, it is reduced to low voltage and distributed to millions of end users. Figure 2. Map of High Voltage Transmission Lines. Source: U.S. Energy Information Administration 2012. All of this, from the door of the generating station to the door of the customer, is properly part of The Grid. However, this series of posts is going to focus on the high voltage and ultra-high voltage transmission system, aka the bulk power system. Figure 2 shows the network of ultra-high voltage transmission lines in the United States, color coded by voltage (kV = kilovolt, DC = direct current). The Grid is densest in the eastern part of the country. There is also an area of the country where there are very few transmission lines, especially running east-west. The Grid is organized into 3 large interconnections. Within each interconnection, all of the power has the same voltage and it is precisely synchronized. Power crossing the boundary of two interconnections has to be adjusted. The Eastern Interconnection includes everything east of the Rocky Mountains, while the Western Interconnection includes the Rocky Mountains and everything to their west. The Texas Interconnection includes most of the State of Texas. There are surprisingly few connections between the Eastern and Western Interconnections. Missouri is part of the Eastern Interconnection. Thus, Missouri is part of a big electrical network that includes everything from the Rocky Mountains to the East Coast, from Texas and Florida to the northern edge of Manitoba and Saskatchewan, all of which is coordinated and precisely synchronized. Now, in the description above, I noted that The Grid includes generating stations and transmission systems. In some locations, electric utilities own both the generating stations and transmission systems. That is the case with Ameren and Kansas City Power & Light, Missouri’s 2 largest electric utilities. Sometimes, however, they are separate. In these cases, a generating station may be owned by one company, while the transmission network is owned by a separate company. If the transmission company operates only in one state, it tends to be called an Independent Service Operator (ISO). If it operates across multiple states, it tends to be called a Regional Transmission Organization (RTO). For our purposes here, we may view ISOs and RTOs as roughly similar. We’ll investigate this a little more when we look a little deeper into how The Grid is organized in the next post. MBizon. Electricity Grid Schematic English. 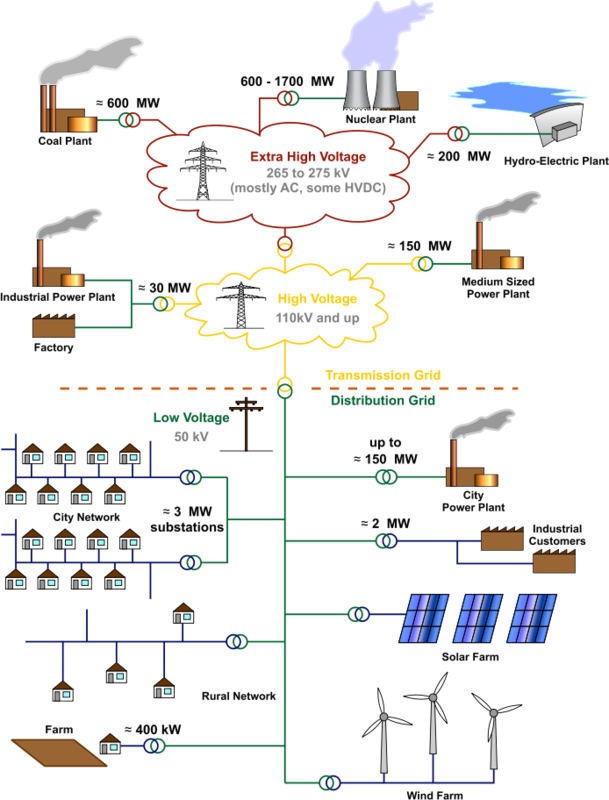 Downloaded Nov. 2014 from https://commons.wikimedia.org/wiki/File:Electricity_Grid_Schematic_English.svg. U.S. Energy Information Administration. 2012. 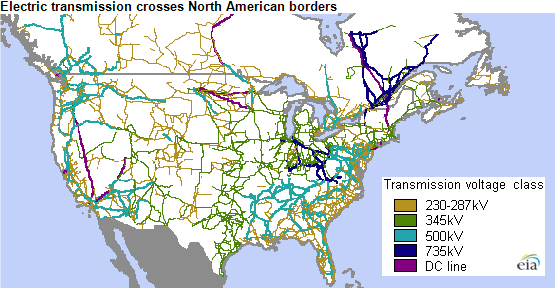 “Electric Transmission Crosses North American Borders.” In Canada Week: Integrated Electric Grid Improves Reliability for United States, Canada. Downloaded 4/27/2018 from https://www.eia.gov/todayinenergy/detail.php?id=8930. By mogreenstats in Energy on 2018/05/10 .